The title A Line Broken affirms the simple but profound truth that all things must eventually end, whether a piece of music, a concert, or a human life. One powerful expression of this reality is Courtney Bryan’s remarkable As Yet Unheard, a work for orchestra and chorus that commemorates Sandra Bland’s tragic death in police custody in 2013. Using the text of Sharan Strange’s poem, soprano Helga Davis speaks to us in Bland’s voice, prodding us to relive the circumstances of her death and to seek answers to painful questions too long unasked. Bryan’s piece is perfectly complimented by Gabriel Faure’s luminous Requiem. The requiem has long been a popular form among composers, and celebrated practitioners of the genre include Mozart, Verdi, Brahms, Berlioz, and Britten. Unlike those of his fellow composers, Faure’s Requiem contains no Sturm und Drang, no thundering crescendos or rallying cries to the deceased. Rather, it’s a gentle, contemplative work, more of a meditation on transience than an exhortation. 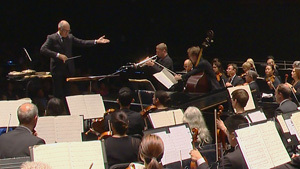 It contains most of the form’s familiar elements, including mixed chorus and soloists (in this instance baritone Jonathan Nussman and soprano Priti Gandhi), but they are employed in service of an effect that is uniquely Faure’s own. This piece has steadily gained in popularity and the final section, “In Paradisum,” is familiar to many from its use in several films, television programs, and commercials. Asher Tobin Chodos’ adventurous arrangement of Ornette Coleman’s Lonely Woman places a quartet of jazz soloists within a symphonic context. Just as innovator Coleman sought to reframe jazz conventions in an idiosyncratic style, so Chodos’ arrangement seeks to reposition this 1959 work in a modern idiom, one that embraces and even expands upon the challenges of a composition that, in Chodos’ words, “occupies a middle ground between specificity and discrepancy.” Most importantly, this new take on a classic preserve the beauty and immediacy of Coleman’s original. Rounding out the program is Rand Steiger’s ingenious Template for Improvising Trumpeter & Orchestra. As noted by the title, this piece centers on the talents of virtuoso trumpeter Peter Evans in a performance that is largely (though not entirely) improvised in performance. Evans’ tones are manipulated at times by the composer through digital signal processing, in what amounts to another interdependent and improvised performance; indeed, the watchwords for the entire enterprise are exploration and collaboration. In his program notes Conductor Steven Schick comments that “Music is the natural medium for life-force,” and in this concert’s seemingly disparate selections we hear that life-force in all of its manifestations. Watch A Line Broken – La Jolla Symphony & Chorus.